Drop by for a test run! Come back for a few more! If you decide that you like us (and why wouldn't you? ), cost to join is $50.00 for 6 months (payable to New Westminster Parks & Rec). This includes use of reflective running vests and heated change and meeting rooms with washrooms in the band shell. If you need more information contact us. Is a run around the block enough to wind you? Yet you wish you could do much more? 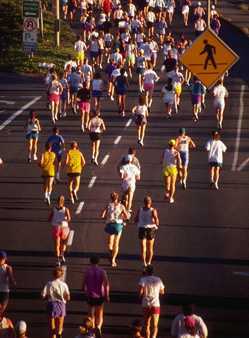 We have club members who lead Sun Run clinics starting in the new year. Anyone can follow these programs and complete a 10k! If you want some extra group runs for your Sun Run training, or want/need motivation to continue after the Sun Run, come run with us! Out of Town Visitors: Are you looking for someone to run with while staying at New West Quay, North Rd, etc? Why not drop by and join us?